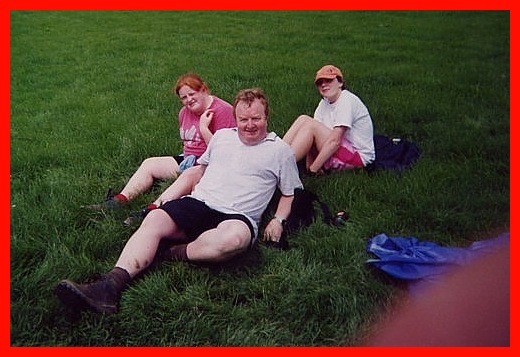 I thought Brilwalks visitors would enjoy this email from Alan, who did the White Peak Walk with me back in 1995, relating his view of the 2004 White Peak Walk, which he did with his daughter and her friend. I have added comments in red italics, which hopefully will be helpful! Well, I've got more blisters than expected. Emma struggled and was in tears at Birchover....... but we both completed it. Our claim to "fame" - WE WERE LAST! . - apart from the retirees of course. 11 hours 21 minutes was the time! When driving there, just before reaching Bakewell, it began pouring with rain and the skies turned black. The car radio automatically re-tuned to "Peak 107" and the DJ said "it’s pouring outside and the forecast says it’s going to be WET, and then WET....... and then WET with some Thunder". We thought “oh no” and to think we had been worried that, as in previous years, it was going to be one of the hottest days of the year. In reality, when we arrived at Monyash, despite the forecast, it had stopped raining, but we heard other participants saying it had been raining a solid hour beforehand. However, the area had also suffered, earlier in the week, the same two days of heavy rain as most parts of the country. Therefore it was wet underfoot, and "ponds", that I never knew about, were seen for the first time. In some places, during the first hour, it was like walking a tightrope along 10 inch wide tracks between the tractor ruts that were full of water. The water also made it very slippy, especially on the rocky steps and surfaces during the later stages of the walk when the drizzle became more prevalent. Emma are waiting for the walk to start. We parked the car, registered and we were approaching the starting line outside the Bull’s Head when we heard the starter say “10 seconds” and then we were off. In the rush I realised that I was still wearing my spectacles. I had intended to leave them in the car as I felt that they could become a hindrance. Should I run back to the car (which was in the farthest field from the road) and leave them there and then catch the girls up, or forget it. I decided on the latter. About 1 hour 35 minutes into the walk, when going through Priestcliffe, the rain started again. I took the glasses off, as they were becoming a hindrance, and put them in my waterproof jacket pocket. Later the sun came out and, with my jacket round my waist, the items in my pockets were noisy and hitting my legs, so I put my glasses in my shorts pocket. I then forgot about them. However, at Bakewell I put a hand in the pocket and a lens dropped to the floor. I realised the frames had broken. Oh well - it didn't matter at the time as the experience of the walk was more important. (Have you seen the price of spectacles recently?) Maybe I should have taken a couple of minutes to take them back to the car. It would now be more of a “strain” when I returned to Nottingham afterwards, followed by a drive to Weston Super Mare for an afternoon garden party the following day, before returning home to Winchester in the evening. After previous experiences of spectacle damage I had always intended to carry a second pair in the car, but since getting a new car last year had forgotten to put the spare specs in. I had reckoned that we would complete the walk in about 11 hours. However, I was erring on the side of caution as I was hoping it would be 30 or so minutes quicker. I felt that I was fitter than in previous years by working out in the gym three to four times a week. 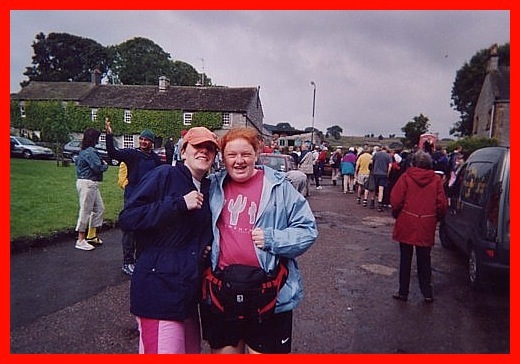 But weighing in at about 17stone 3lbs, I was still as heavy as I was when I last did the walk in 1999. This is despite having lost just over a stone in the last 6 months. I thought Emma (Alan’s daughter) would struggle, but knew she would persevere to try and finish it. Emma's friend, Amelia, who was also on the walk, always seemed fit in the walks we did in working up to this event and should have no problem. Well this time I felt that I could walk with Amelia at around my pace, but we kept “holding back” for poor Emma. Unfortunately I didn't check times at each checkpoint but I know that, despite queuing at stiles towards the first checkpoint, we went through it (Waterloo Hotel on the A6) at around 11.20am, and at the 2nd checkpoint were told that we were on target to finish around the nine hours mark (7 p.m.). A likely story I thought, but the brain was not in the slightest bit interested in checking as to whether the statement was right. Emma was a couple of minutes behind us climbing the path to Monsal Head where we had our obligatory ice cream, (Are ice creams allowed when you are trying to lose weight?) and probably more like ten minutes climbing up through Manners Wood after the golf course at Bakewell. Here we lightened our load by eating the packed lunch at the top. I told Amelia that she could walk on if she preferred, although I said if possible it would be better if we could all stick together. 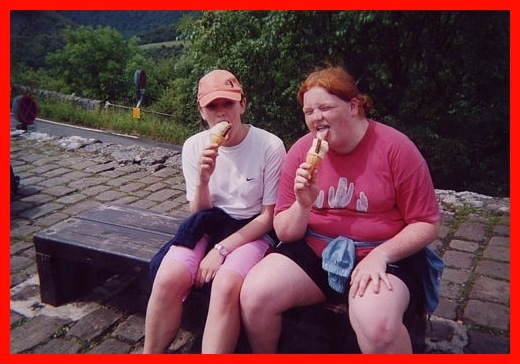 Amelia (left) and Emma, enjoying the "obligatory ice creams" after first "sting" at Monsal Head. On an easier part of the walk between Calton Lees and Rowsley (walking alongside the river) we all seemed to be coping well and walking at the same pace and enjoying conversations. (Surprisingly enough on driving back to Nottingham after the walk Emma said she found only one part of the walk "boring" and this turned out to be it). "Around 2pm after perceived toughest climb of walk though woods after Bakewell (golf course). Time for a twenty minute break for lunch. Nearly half way. Coincidentally the man I asked to take the photo was the "sugar daddy" who turned up later on in the story. I sensed when he took the photo that his thumb or finger (or something) may have been over the lense - and now the evidence is there". Whilst enjoying a cup of tea at the checkpoint at Rowsley I heard one of the organisers saying there were twelve more people to come through. About ten minutes later, as we're nearing the road, I mentioned to the girls that most people go across the Moor but we would go the road way today as all other walkers in sight were taking that route. I quite innocently added that next year we would go across the top of the moor as it was more interesting. Emma responded aggressively "I am not doing it next year or ever again. I hate it"! Amelia and I stole a glance at each other but were speechless and walked on. About half a mile before Birchover, the family turns up. Brother Graham and his daughter from Nottingham, Wendy (Alan’s wife) & David (Alan’s son) were in Graham’s car coming towards us as we were walking up the road. My brother had, the previous evening, offered to be "on call" to pick anyone up, if it was necessary, as it could be a long wait if anyone finished early and had to wait for others. I think the emotion, when the car drew alongside Emma, who was probably about 50 yards behind Amelia & I, was considerable. My brother turned the car around and said they would meet us at the checkpoint a few hundred yards ahead. It’s a strange experience really as, although I was suffering myself with feet & toes aching and what felt like blisters forming, I started to feel a lot worse with my legs trembling and calf’s throbbing as I walked down the hill to the Birchover checkpoint to see the family, (It’s a strange effect that Wendy has on Alan!!!). As I refreshed myself with squash at the checkpoint, the family talked to Emma to try and offer help - if she wanted it. The "staff" on the checkpoint were fantastic suggesting she had done 19 mile, broken the back of it, it was only 1.5 mile to the next checkpoint at Harthill Moor and that she should just commit to one checkpoint at a time, and by the time she gets to the next point she'll have done over 20 miles etc.etc. Some humour was thrown in by the St. John's Ambulance man who offered to look at her blisters and pop them. Another couple of walkers also helped tremendously. We had already spoken to them a few times earlier in the walk, as we were walking about the same pace, or maybe they were a little faster but we were catching up on any steep climbs or steps. They offered to walk with Emma saying that they had no races to win etc. We all decided to carry on. Graham said they'd hold back and meet us at the next checkpoint to see how Emma was. As we walked through Birchover I mentioned the shop where I normally get my second "obligatory" ice cream. (No comment!) It was still open. However, with Amelia going a few yards ahead and the fact that we were now with another couple, and the weather was suddenly getting cold - it dropped about 7 degrees in about five minutes - I thought perhaps it would be better to carry on. I had not really noticed that Amelia had strode on ahead of us, but when I did I thought that we would probably see her at the next checkpoint, if not before. As we steadily walked down the steep hill towards the bottom of Robin Hood’s Stride one of the walkers, who we had seen in the pub, said “Excuse me” and literally ran past us down the hill, (Oh to be young and fit). We could see the family waiting at the Harthill Moor Checkpoint. Emma was brighter at this point. Graham updated us with Amelia's whereabouts saying she was steaming through "with her sugar daddy". Apparently she was walking with some older gentleman who knew the way etc. (We found out later that this "sugar daddy" was the gentleman we saw in the pub in Birchover, who later ran passed us down the hill before Robin Hoods Stride). Emma advised us of her intention to continue and my brother and family confirmed their plans to return to Nottingham as “dinner was waiting”. On walking up the steep path from Bradford Dale into Youlgreave, my mobile rang. Shock horror, it was my brother advising that Amelia had phoned. She had pulled out at the last checkpoint (Long Rake) and wanted to be picked up. Apparently she was short-of-breath, anxious and mentioned a knee problem as well - something she suffers with from time to time. Graham went on to say he was twenty minutes away as he had been driving back home. After leaving Harthill Moor, my brother had decided to drive to Youlgreave to see if they could see Amelia, which they did, still with this man. It was noted that other walkers were taking a different route at the bottom of Moor Lane. You can imagine our worries. We were suddenly very concerned about Amelia. Half way up Moor Lane (the road between Youlgreave and Long Rake) my brother and family drove passed Emma, me and a couple who were walking with us. My brother phoned about ten minutes later to advise that they'd picked up Amelia, that she was okay, and they were on their way back to Nottingham. With hindsight, I realised that we should have all stuck together no matter how "tiring" it is to hold back for a slower paced walker. After all, the girls are only fifteen, had never done the walk before and did not know the area. Amelia had walked with an unknown man and found herself on her own with him and nobody else was in sight. Furthermore we were the only people she knew and we were at least a mile away. When my brother passed us in Moor Lane (it was drizzling at this stage and for most of the rest of the walk), I wished I’d asked him to wait with Amelia until we caught up. We were now only 20 minutes away from the checkpoint and Amelia. I am not sure whether she could have changed her mind about retiring but she hadn’t broken any of the rules about getting into a car or anything. I know Amelia could have finished it. Amelia’s “knee problem” has not been mentioned since. I think it was more anxiety than anything else. Both Emma and I are still suffering and Amelia appears to be as fit as ever and has certainly no signs of damage or blisters etc. Emma and I followed the other couple into Monyash Village Hall at 9.21pm. The walk had taken us 11hours 21 minutes. It was quite amusing because after the welcome applause died down, one of the organisers said "That's it then”, and appeared to end what he was doing. Emma asked "Are we last then?". It was affirmed. We smiled. It must be better to be last than two from last... mustn’t it? (No comment). We've made it, and we've got the certificates to prove it. The pie and mushy peas, fruit salad & cream and cup of tea were most welcome and enjoyed more than ever before. I jokingly asked one of the helpers as we were finishing off eating whether I would still be able to get the car out the field. He acted surprised, but assured me that it was okay (I really didn't think that it wouldn't be). We hobbled to the field where the car was parked. As it was dark, initially I thought a farm vehicle was blocking the gate, but fortunately the vehicle was next to it. But low and behold the gate WAS closed. Fortunately I was able to open the gate and someone from the building next to it opened their window and looked out. I told them I was just collecting the car and would close the gate after me. Although it was drizzling and we were cold, Emma & I stripped off our top clothes in the middle of this dark damp cow field to replace them with something warmer. I then eased off my muddy boots and tried to force on my shoes (unfortunately I had forgotten my trainers). It was no good; I had to take the thick socks off as well. The purple blisters underneath my toes and blister at the bottom of my heels showed that despite preparation I was still suffering. In fact Emma & I later compared blisters and I can claim fame again in that my blisters are worse than hers. Just going back to a bit earlier in the Village Hall, as people left someone said to me "see you next year". Emma reaffirmed that she'd never want to do it again as it was much harder than she thought it was going to be. I was not sure whether I'd ever return. 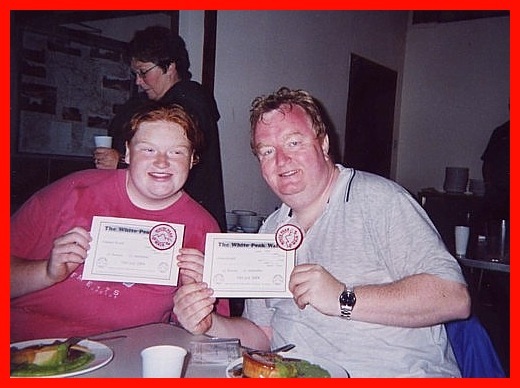 However, less than 24 hours later, on returning home to Winchester (after hobbling around the garden party in Weston Super Mare), David stated that he wants to do it next year (as he will have just turned 15) and he brought to me the 2005 entry form that he has just printed off the website. Well I had only intended on giving a short résumé. But I hope it gives you a flavour of what it was like for me this year.